F. Wheeler Loomis came to Urbana in 1929 as professor and head of the Department of Physics of the University of Illinois. We have selected this nontraditional photograph of Wheeler Loomis, showing him as a young faculty member, deliberately. Throughout his long and distinguished career at Illinois, he retained the vigor, imagination, and unpretentiousness of a young man. A noted scientist and administrator of science, he headed the department until 1957, building it into one of the leading physics departments in the world. He was honored by election to the presidency of the American Physical Society and to membership in the National Academy of Sciences, both in 1949. Wheeler Loomis made important contributions to national defense as associate head of the M.I.T. Radiation Laboratory during World War II, as head (1951-52) of Project Charles, which led to formation of the M.I.T. Lincoln Laboratories, and as director (1952-59) of the Control Systems Laboratory at the University of Illinois. Loomis was born August 4, 1889, in Parkersburg, West Virginia. He attended schools in Ohio, Wisconsin, and Massachusetts. Both his undergraduate and graduate work were done at Harvard University, where he received his Ph.D. in 1917. During World War I, as a captain in the Army Ordnance Department, he was in charge of antiaircraft range firing and preparation of ballistic tables at the Aberdeen proving ground. For two years, he worked as a research physicist at the Westinghouse Lamp Company, then joined the physics department at New York University. While abroad in 1928-29 as a Guggenheim Fellow studying at Zürich and Göttingen, he was invited to become head of the physics department at the University of Illinois, a job he retained until just before his retirement, except for the leaves of absence for work at M.I.T. on national defense. Loomis began research in physics with his Ph.D. thesis on thermodynamics, but following World War I, he changed to the new field of molecular spectroscopy, a field in which he was active up to World War II. In 1920, he discovered the isotope effect in molecular spectra, thereby opening the way to identification of several molecular species and to discovery of important new isotopes, including several of carbon and oxygen. He also did important work in diatomic molecules of iodine and the alkali metals. A believer in the importance of attracting beginning students to science, for years he gave the lectures in elementary physics himself. He exemplified his own ideal of a faculty totally involved in physics, every member active in research, and teaching at both the elementary and advanced levels. He demonstrated keen judgment of young scholars, in identifying many who later became famous and in creating a climate for their work. 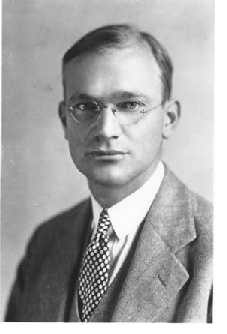 Among his graduate students was Polykarp Kusch, who, as professor of physics at Columbia University in 1955, won the Nobel Prize in Physics. Loomis built the physics department twice, once before World War II, and again afterwards. In the former period, he attracted a group of young scientists, then relatively unknown, including the noted theorists S.M. Dancoff and R.H. Serber (later president of the American Physical Society), D.W. Kerst, who invented the betatron while at Illinois, L.J. Haworth, later director of the NSF, the noted experimenters N.F. Ramsey and Maurice and Gertrude Goldhaber, and R.H. Bolt, an expert in acoustics. Others included G.M. Almy, E.M. Lyman, P.G. Kruger, who helped found work on nuclear physics at Illinois, and the theorist J.H. Bartlett. In rebuilding the department after World War II, Loomis added the fields of solid state and low temperature physics to the department in 1949, bringing the noted theorist Professor Frederick Seitz, now president of Rockefeller University, to head the group, Professor R.J. Maurer, and four instructors to begin experimental work, David Lazarus, Dillon E. Mapother, Charles P. Slichter, and John C. Wheatley. Later additions included Professor John Bardeen, who in 1956 shared the Nobel Prize with William Shockley and Walter Brattain for the discovery of the transistor, and who in 1972 again shared the Nobel Prize, this time with J.R. Schrieffer and Leon Cooper for their joint work at Illinois that gave an explanation of superconductivity. Other notable scientists whom he brought to Illinois included the well-known particle theorists Geoffrey Chew, Francis Low, and K. Nishajima. He also brought Chalmers Sherwin and James Allen who did important work on establishing the existence and properties of the neutrino. Loomis's ability as a keen judge of science talent, and his ability to generate a strong enthusiasm and sense of purpose among his colleagues, led to his being asked by Lee DuBridge, the director, to assume the number two position in the M.I.T. Radiation Laboratory, a post Loomis held from 1941 to 1946. The Laboratory was the principal developer of radar in the United States. In 1951, possession of the atom bomb by the Soviet Union led to concern over the air defense of the United States. As a result of his reputation among America's top scientists as a perceptive and strong leader of a research team, Loomis was called upon to head a study, Project Charles, to investigate possible steps. President Killian of M.I.T. wrote him, "There is serious question as to whether any other person could be found who could hold together the team required for the work." For a period of eighteen months in 1951-52 Loomis directed Project Charles and the formation of the Lincoln Laboratory, which was operated under the auspices of M.I.T. In 1952, after the Korean War broke out, Loomis founded and directed the Control Systems Laboratory at the University of Illinois to contribute to further development of air defense. Later the name of the laboratory was changed to the Coordinated Science Laboratory and its work became unclassified. "The misconception that physics is primarily a utilitarian subject pervades even the university campuses, where it is studied largely as a tool by engineers and premedics and studiously avoided by our colleagues who plan the curriculum in liberal education; or at least so diluted as to be unrecognizable. Unless one defines a humanity as a subject of which everyone thinks he understands something, or as one suitable for dinner-table conversation, physics deserves as high a rank among the humanities as any discipline whatever, and its omission will leave just as wide a gap as would the omission of philosophy or history in the appreciation of the major intellectual achievements of our civilization and the forces which affect it." His style was direct and to the point, often spiced with dry humor. Describing himself, he once wrote, "I am married and have three small daughters. My avocations are yachting (15 foot nondescript) and mountaineering, or at least hilling." In response to a graduate student doing research on the history of quantum physics in the United States between 1920 and 1935 he wrote, "You ask whom I was particularly associated with in Göttingen in 1928-29. It was James Franck. In Zürich I was 'under' Pauli, but I spent most of my fellowship term there on a trip back to the States to study and consider an offer from the University of Illinois, which I accepted." Loomis's abilities as a leader of scientists led to repeated invitations to head major government agencies, university departments, or otherwise take up new careers. But though he took leaves to serve his country, he always returned to his position as head of the physics department he had built at the University of Illinois. He most wished to be close to working physicists, to try to build an active center of the best physics. He knew he could best achieve this goal as department head where he could judge what was happening first-hand, take part as a colleague in discussions of the results of research, and help to promote that spirit of excitement and of the importance of doing physics by his presence. Scientists worked hard for him because he conveyed to them his own sense of the importance of the work on which they were embarked.